Hannah Vogel, Sydney Shaefgen, Angelina Dyrnaes, Sierra Read, Whitney Winefordner and head coach Steve Lalim. Photo courtesy of girls cross country. 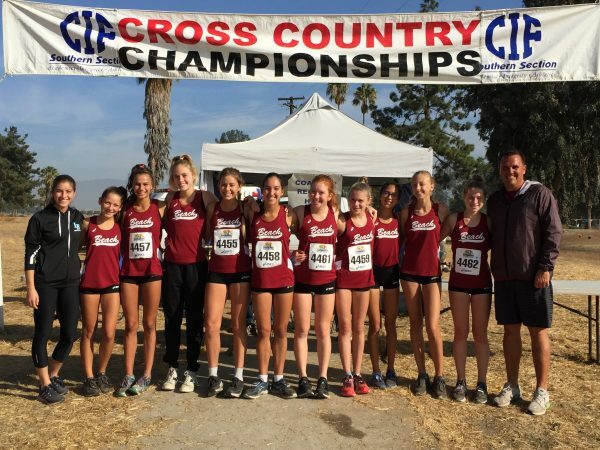 Laguna’s boys and girls cross country squads breezed through the qualifying run last Saturday, Nov. 11 at the Riverside course. The teams will return for the Division 4 finals this Saturday to the same course. Luc La Montagne led the boys team with a time of 16:30.9 on the three-mile course while Jessie Rose led the Laguna girls with a time of 18:15.0. Both teams were ranked sixth in the final regular season poll and hope to advance to the state meet Nov. 25 in Fresno. Breakers have made it to the section finals the past 18 seasons for boys and 14 seasons for girls.